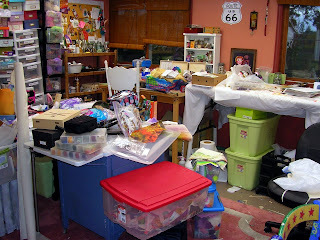 Okay--I've decided to show you WHY I had to give some stuff away. I was drowning in disorder. To my own defense, the book has really been consuming a lot of time and I didn't put anything away for month. I had some nice small padded envelopes passed on to me from work, where they just throw them away. I started stuffing them and realized I was going to get nowhere. So daughter and I went to the local office store to get *larger* envelopes (10"). As we were entering, a couple turned and handed us a gift card for $10. They said "we couldn't find anything we wanted and this expires today." How awesome was that? I'll be sending them out in batches soon! 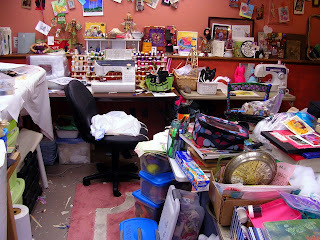 This is a working studio. I don't see anything to be embarrasses about. I think it is fun to see where everyone works. I also like your self portrait dolls. the bright colors are great!